The government and the police forces are not in favour of banning pellet guns forever. However, it’s decided that the use of the pellet guns can be restricted to rare cases to handle violent mob. CRPF and Jammu Kashmir police have been facing strong protest from the valley. An expert committee has been set up to find an alternative for the pellet gun usage. The seven-member committee has suggested the usage of chilli-filled grenades (PAVA shells) and ‘stun lac shells‘ to control the mob. According to sources, Pelargonic Acid Vanillyl Amide (PAVA) also called Nonivamide and other non-lethal ammunition like ‘stun lac cells’ and Long Range Acoustic Device (LARD) which create deafening noise to paralyze people will be effective to replace pellet guns. The expert committee submitted the report to union home secretary Rajiv Mehrishi after giving a nod to PAVA shells. “There will be no blanket ban on the use of pellet guns. At the most, it will be used in rarest of rare cases. We cannot make our security forces a sitting duck,” said a government official. “We do not want people to lose their lives, and that is why these alternatives were being used. The security forces already have tear gas shell guns, and they only require enhanced grenades, which the BSF will supply,” said an official from the home ministry. 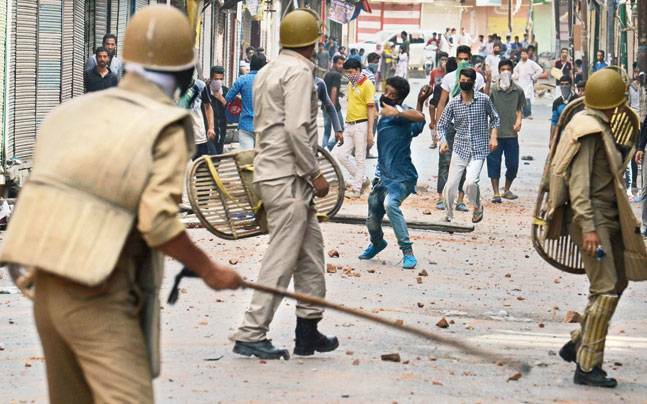 The Kashmir valley unrest has been on a hike from the day when Hizbul Mujahideen terrorist Burhan Wani was killed on July 8.the government and Kashmir police is facing huge protest from the people. CRPF is currently assisting the Kashmir police in restricting violent mobs in the valley. Recently the union home minister Rajnath Singh visited Kashmir Valley and said that the alternative for pellet guns would be supplied soon for the security persons.